Why are core exercises important for cyclists? Core exercises are important for every activity. Cycling requires core strength to avoid injury, ensure efficient energy use and to optimise performance. As fatigue sets in many cyclists lose lumbo-pelvic stability, leading to hips see-sawing in the saddle, loss of energy transfer from the legs to the pedals and lower back pain. Many cyclists focus on their lower body strength to improve the power being put through the pedals. However, cycling also requires significant neck and postural strength to support the upper body on the handlebar. This is where your core exercises will help. Imagine if after all your leg training your ride was cut short by a sore neck! Improving core strength and endurance by following these core exercises, will allow you to maintain good technique and make the most of your next sprint, climb or endurance ride. What do we mean by ‘core’? 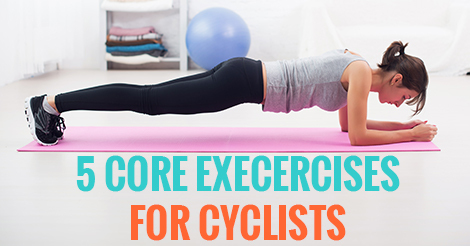 Before we get into the 5 core exercises for cyclists, it’s important to cover exactly what we mean by ‘core’. Traditionally the term ‘core’ refers to transverse abdominus, pelvic floor, diaphragm and multifidus as seen in the diagram below. 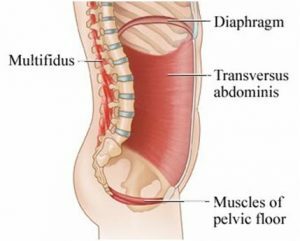 For the purposes of this article I’ll be focusing on the transverse abdominus, paraspinal muscles and the muscles responsible for neck and upper back strength and stability. 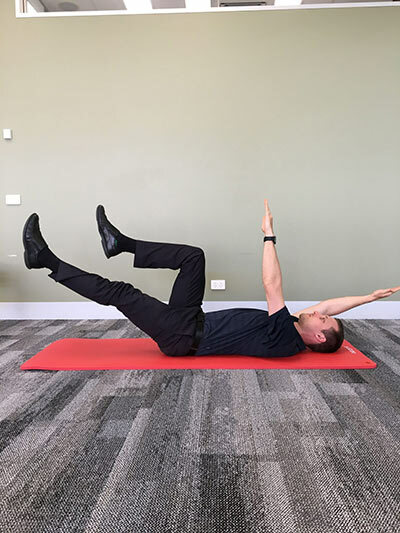 The 5 exercises below contain a mixture of strengthening and stability work for the abdominals, neck, shoulder girdle, thoracic spine and lumbo-pelvic region. 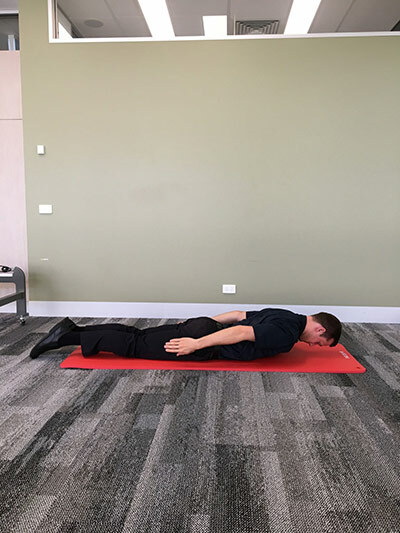 Lie on your back with your legs in ‘tabletop’ position (hips and knees bent to 90 degrees) and your arms reaching straight up towards the ceiling. Straighten one leg to approximately 45 degrees. At the same time take the opposite arm back above your head. Repeat with the opposite arm and leg and continue alternating sides. Hint: if this feels too hard, practice straightening one leg at a time. Then practice straightening one arm at a time. Once you’re comfortable with these movements separately, add them together into the opposite arm and leg movement. Make sure your lumbar spine (low back) stays in a neutral position – no arching away from the mat or flattening your spine into the mat. Don’t let your ribs flare towards the ceiling (keep the lower ribs drawn down towards the pubic bone). Increase difficulty by lowering your leg/arm closer to the ground – this will increase the load on your abdominals. Make sure you don’t lose your technique as you lower! Lie on your stomach with your arms by your sides, palms facing in towards the body. Rest your forehead on a folded towel so that the back of your neck is long and makes a nice straight line with the rest of your spine. Slide your shoulder blades down your back so that your shoulders are gently held back and down. At the same time lift your head, chest and hands up off the mat (your sternum/breastbone should hover a few centimetres off the mat). Hold for a breath in and lower back down as you breathe out. Keep your chin slightly tucked and your eyes looking down your nose so that your neck stays long and in line with your spine as you lift. The lifting motion should create extension in the thoracic spine (mid back), make sure to keep your lumbar spine (low back) relaxed as you lift. If you find that you’re extending through your lumbar spine, don’t lift your chest so high. Place hands underneath forehead in starting position (rather than by side). Lie on your back with your arms by your side. Have your knees and feet hip width apart. Push down through your heels and lift your bottom up into the air until there is a straight line through your torso and thighs. Keep your spine in a neutral position (don’t arch your back at the top of the lift). Keep your hip bones level (make sure your pelvis doesn’t tilt to one side). 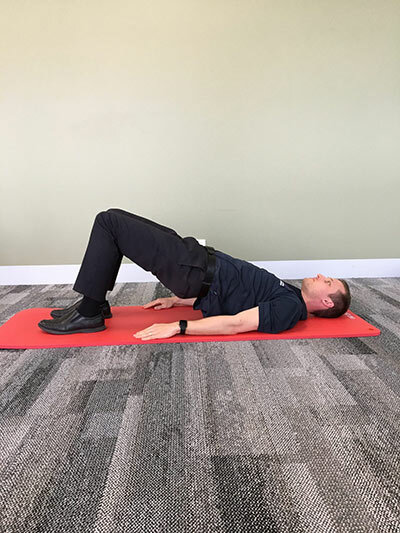 If your hamstrings are cramping, move your feet closer to your bottom – this will activate your glutes and take some of the load off your hamstrings. At the top of the bridge, lift one leg off the ground to approximately 45 degrees (thighs should be in line with each other), hold for 1-2 seconds and slowly lower. Hold one leg off the ground at approximately 45 degrees throughout your bridge (so the thigh is in line with the thigh of the stabilising leg). Rest your forearms on the ground with your elbows under your shoulders. Shoulders held gently back and down. Feet hip width apart, knees resting on the ground. Lift your knees, straighten your legs and take your weight through your forearms and toes. 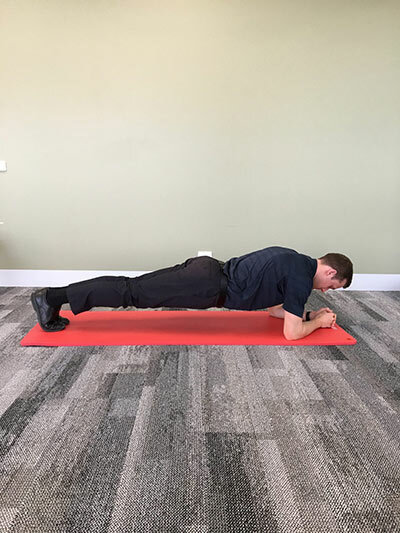 Hold plank for as long as you can. Slowly lower knees back to ground. While holding the plank, hover one foot 1-2cm off the ground (keep the leg straight). Hold for 1-2 seconds and slowly lower. 4 point kneeling: knees under hips and hands slightly forward from shoulders. Long neck and neutral spine. Slide one foot behind you to straighten your leg. Lift the leg up off the mat. At the same time, lift the opposite arm out in front of you. Hold 1-2 seconds, then slowly lower. 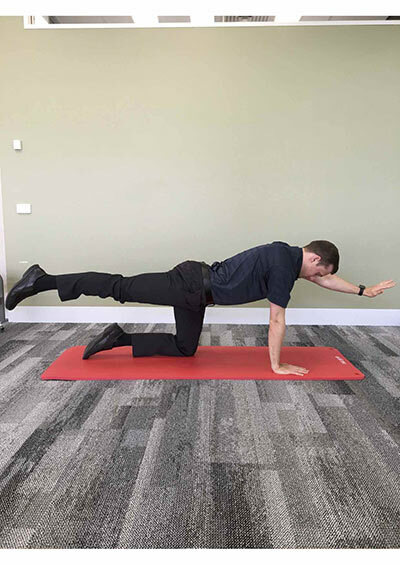 Hold at top of lift, gently pulse arm and leg up and down for 10 pulses (keep the movement small and maintain control through spine and pelvis). Sophie graduated from the University of Canberra with a Bachelor of Physiotherapy (Honours) after completing her thesis on physical activity promotion. 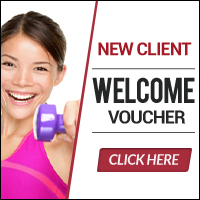 Her special interests include rehabilitation from sporting injuries, women's health, pilates and using functional exercise to enhance health and fitness. Outside of work Sophie enjoys spending time outdoors, running and yoga.